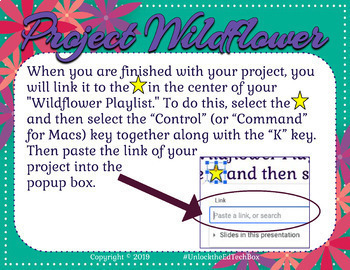 Have fun with your students while they research and create their own Wildflower Brochure or News Report with a choice of multiple ways to report their wildflower(s). 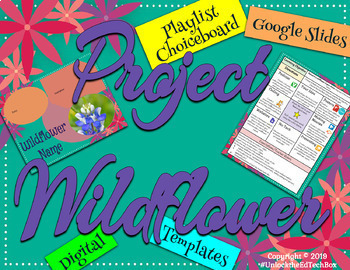 You will receive student instructions, a playlist/choice board with a variety of ways to report their Wildflower(s) and a Google Drawing Brochure Template. You can edit the Playlist/Choice Board to make it work with your lesson and tools. There is also an editable slide for you to put your own websites to research should you prefer to use different ones. A great way to give students voice and choice! 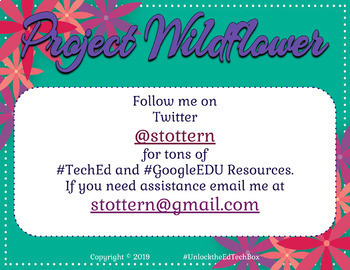 Included is a PDF version with a link to the Google Slide versions which can also be downloaded as a PowerPoint. 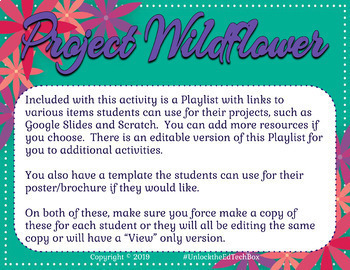 This project can also be used in team activities and center activities and is great fun to create a way for them to show their work collaboratively or even create a class eBook or Website. Email me if you would like more ideas.